Reviewed as a “very special performer…prodigious technique” (Dance Magazine) “physically expressive, a pleasure to watch” (The New York Times) University of Kansas professor Suzeau is the recipient of several grants and choreography commissions from private and public funds, including two Fulbright Fellowships (Lithuania, Malaysia) and the Master Fellowship in choreography from the Kansas Arts Commission. Formerly NYC based COHAN/SUZEAU Dance Company has toured the Midwest on the NEA Regional and the KAC Touring Programs “This is what art at its best is all about” (Arts Indiana). 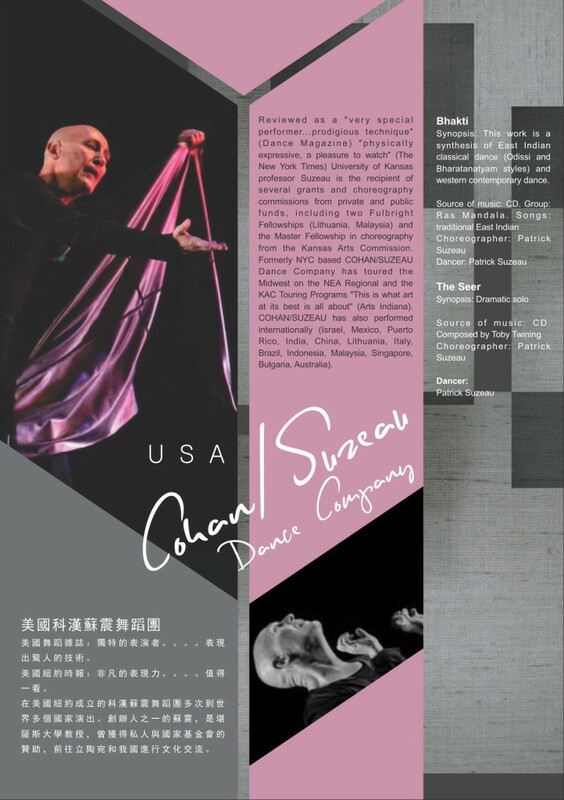 COHAN/SUZEAU has also performed internationally (Israel, Mexico, Puerto Rico, India, China, Lithuania, Italy, Brazil, Indonesia, Malaysia, Singapore, Bulgaria, Australia).